Richardson Marketing makes high impact banners that will help you attract more customers and increase sales. From indoor and outdoor retail banners to portable convention and event displays, we can create a custom sign that will help you create a huge impact on your customers. Do you have a convention, seminar, corporate event or tradeshow coming up in Las Vegas? Let Richardson Marketing help you stand out from the crowd! Our convention banners and popup displays can help you draw attention to your booth, generate excitement around your products and services, and communicate your unique business messaging. From traditional pop-up displays and banner stands, to full color backdrops and custom booth wraps, we can help you create an experience that attendees will not forget. Retractable Banner Stands: Our stands and displays set up in less than a minute, and are lightweight and easy to carry. Custom Full Color Banners: We can create custom banners in any size and shape. 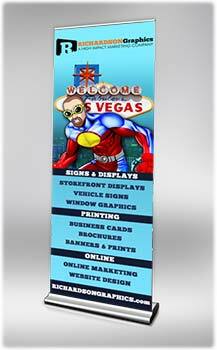 Popup Displays: Our popup banners are lightweight, customizable, and can easily be set up by one person. Hanging Banners: Our Hanging displays can be seen throughout the convention venue and are a great way to direct traffic to your booth. Our indoor banners are great for generating excitement, increasing product awareness, and promoting special events. 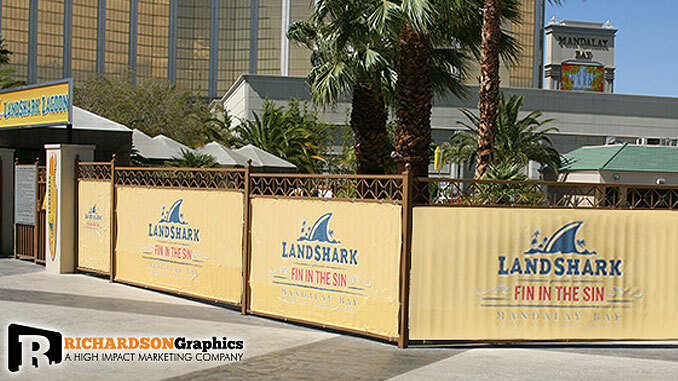 Attract more customers to your business with our custom outdoor banners and displays. They are made with the strongest materials available and will outlast traditional banners. We can make everything from simple vinyl lettering to full color digital prints. Big or small we do it all. Our printers are running 24/7 and we are set up to handle even the largest jobs. Promoting your Products & Services. Banners help attract more clients. Do you need banners for your business or upcoming event?